Offer Terms: £5 must be staked on bingo tickets within 14 days of first opening bingo software. £25 bonus credited automatically upon qualification. Unused bonus funds removed after 2 weeks inactivity. Cash out subject to 4x wagering. Vernons Bingo launched in 2010, and was previously known as Littlewoods Bingo. The site migrated to the ever popular Virtue Fusion network in 2012, and this bought a whole new level of gaming for players to experience. The Vernons brand has been a trusted name since 1925, and all the sites now operate within the broad based Netplay TV plc group in Alderney. The site itself is really bright and engaging, and you are taken through each page by its gorgoeus mascot Stan. Stan is an adorable pug dog who crops up throughout the site. This adds a really fun feature to your gaming, and helps add a nice unique little touch. Everything is so simply to use, and it’s a really perfectly laid out site. The bingo on offer is super varied, and you’ll find big branded rooms as well as rooms that can only be found at Vernons Bingo. You’ll find Rainbow Riches, Cash Cubes, Lucky Numbers and Who Wants To Be A Millionaire rooms, and all bingo comes in variants of 75, 80 and 90-ball games. Vernons Bingo belongs to the larger Vernons gaming brand, so will you will also find an easy link to all of the Vernons casino and sports games on offer too. There are an abundance of amazing promotions constantly up for grabs, including a great welcome bonus as featured at the top of this page, plus a wide array of fun chat games and social media extras always on the go. Vernons puts a huge focous on customer value and care, and the brand are commited to delivering an excellent experience for every single one of its players. 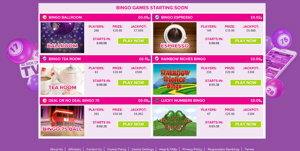 Vernons Bingo offer a fantastic welcome offer for all new players. Simply click on the link at the top of the page for more information. Terms and conditions apply, and all players must be aged 18 or over. Other promotions available include the £30K Winners Night and the Sunday Sales. Win your share of £30K every Sunday night between 5pm and 11pm GMT. There is a guaranteed prize of £4,000 on the 10:30pm game, aswell as BOGOF and roll over games too. The Sunday Sales hosts an evening of fantastic sunday gaming from just 1p a ticket. 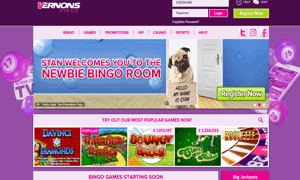 Vernons Bingo operates on the Virtue Fusion software, and the site is owned by the Netplay TV plc group. The company are licensed and regulated by the Gambling Commission of Great Britain, and also the Alderney Gambling Control Commission. The bingo on offer is really varied, and you’ll have the opportunity to play a vast amount of 75, 80 and 90-ball games. There are huge branded rooms with massive jackpots, aswell as unique Vernons bingo rooms which offer a slightly more intimate feel. There is a brilliant bingo schedule always on hand, so you’ll never miss your favourite games. The Vernons brand offer a specific site for their long running sports and casino gaming. The bingo site simply links you to this, and you’ll automatically be able to venture into all they have to offer. Here you will find a huge variety of Blackjack, Roulette and live casino, as well as a massive selection of popular slots titles with fantastic jackpots and huge payouts. The sports section enables total ease within the online sports betting world. Please read all terms and wagering requirements upon registration, as details are always subject to change. Please note, withdrawals can be made from as low as 99p, however there will be a bank charge of £1.50 for any withdrawal less then £10. The Vernons gaming brand is so well established, and the success of their sports and casino sites promises an excellent bingo site with exceptional value and customer care. The bingo on offer is hugely varied, and it offers the perfect combination of branded rooms, and smaller unique rooms with a more intimate feel. The promotions are fantastic and ever changing, offering players enticing deals constantly throughout the year. This is a well designed site that is easy to use, and all in all offers some fantastic gaming.